Jim’s Amazing Elixir Maker Kit which including 50 gram bottle of elixir powder. 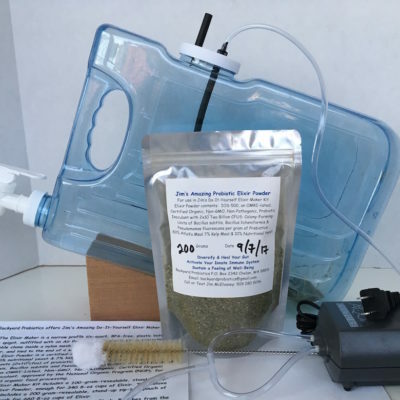 Jim’s Amazing Basic Probiotic Elixir Maker Kit now combines a 100 gram resealable zip-lock, stand-up pouch of Jim’s Amazing Probiotic Elixir Powder, with an Elixir Maker. A clear flexible airline connects the Air Pump to a barb fitting in the Elixir Maker’s fill cap connecting a flexible black polyethylene airline to an air-stone with 2 teaspoons, 4 grams of Jim’s Amazing Probiotic Elixir Powder loose inside the Maker. The Basic Kit also includes one or more of a one ounce glass fine-mist atomizer that is available to each individual family member, at no cost for their use. Elixir Makers and Users will fill the atomizer with “clarified” Elixir, that has been allowed to settle, which may be decanted into the small one oz. bottle) for use, as a Probiotic Spray for skin (allergies, itches, rashes, warts, barnacles, blemishes, abrasions and cuts, for scalps (dandruff, dry skin, actinic keratosis skin tags, eyes (pinkeye), ears (aches, dry skin, for the nose as a nasal spray in each nostril (to shorten the duration of colds and chronic sinusitis) and the mouth for dry mouth, breath odor, and throat (sore throat, dry cough, and congestive cough. The Probiotic Elixir Powder Contents: IOS-500, an OMRI-Listed, Certified Organic, Non-GMO, Non-Pathogenic, Probiotic Inoculant with 2×10 to the 9th, Two Billion CFUS, Colony-Forming-Units of of Bacillus licheniformis, Bacillus subtilis and Pseudomonas fluorescens per Gram of Prebiotics: 83 % Alfalfa Meal, 7% Kelp Meal and 10% Nutritional Yeast. 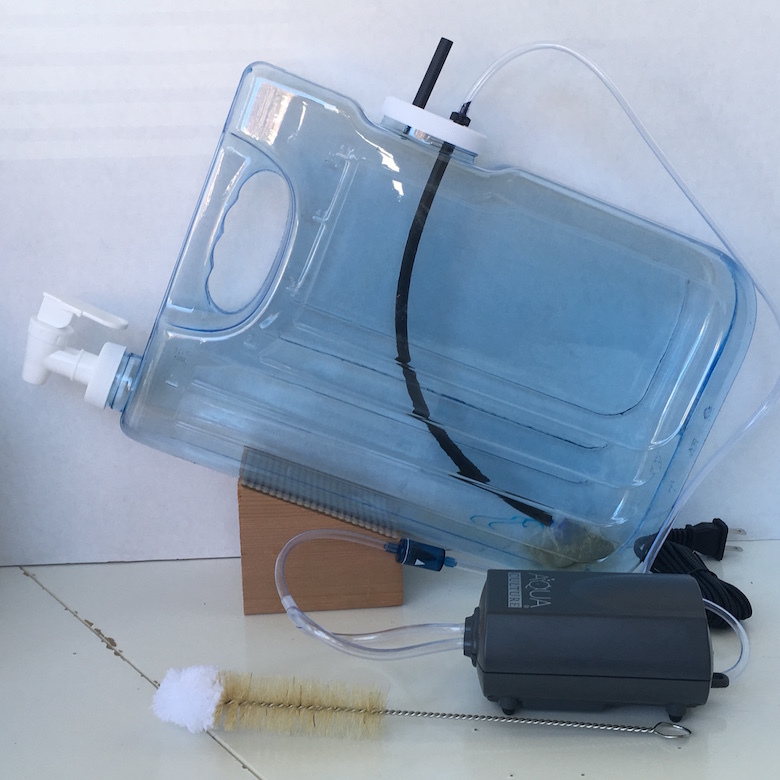 To activate, add 6 quarts of non-chlorinated water, bottled spring water or carbon-block-filtered water and turn on the air pump. 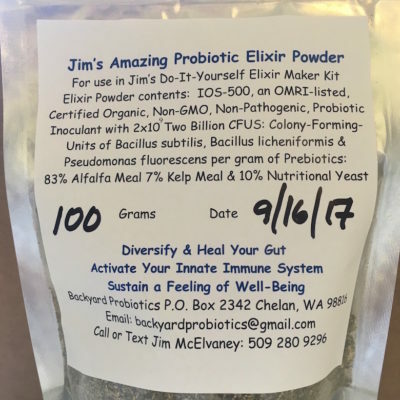 36 hours later, Jim’s Amazing Probiotic Elixir is ready to use. 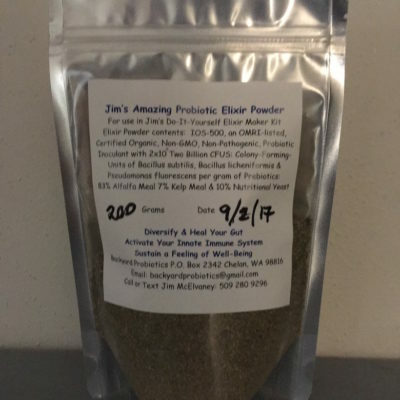 The Elixir Maker Kit with its starter culture of 2 teaspoons, 4 grams, of Probiotic Elixir Powder plus its 100-gram-resealable zip-lock, stand-up Pouch is enough to produce 340 8-oz-cups of Jim’s Amazing Probiotic Elixir.